A boutique hotel, the Betlem Club Hotel in Prague 1 is ranked among the best boutique hotels in Prague. You can enjoy your stay with us in a pleasant family hotel with the atmosphere of a medieval house that has all the modern amenities. We take a personal interest in every visitor and try to make you feel at home even when you are on the move. For boutique accommodations in the city center, we offer 21 cozy rooms, furnished with massive wooden furniture and decorated with dark wooden beams. Each room has a refrigerator, satellite TV, a telephone for direct calls worldwide and a bathroom with all the amenities. 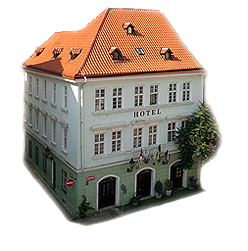 What is a boutique hotel in Prague? Boutique hotels are considered small, comfortable hotels. The city center is a carefully restored area of historic buildings that has retained the distinctive spirit of a medieval Prague. Boutique hotels offer an intimate and cozy atmosphere, full modern amenities and friendly, personal care. This boutique style hotel differs from the uniform impersonality of many larger hotels and appeals to visitors looking for a "home away from home", so these accommodations have a home style feel.